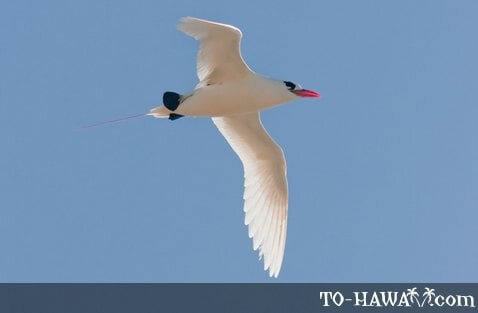 The red-billed tropicbird breeds on tropical islands like Hawaii. Adult birds are slim and mainly white. They have long wings and a red bill. Adult males and females look similar, but males have longer tails. Juvenile birds have a yellow bill and a greyer back. In breeding season a single egg is laid in a nest on the ground or cliff edge. Their diet includes fish and squid.